In an earlier post, we found interesting slides for our lectures. Now let's take a look at how we might create our own eye-catching slides. For this exercise, we'd like to create slides for the 10 Questions to Ponder we posted last week. We'll focus this week on photo hosting/sharing site flickr. Flickr is a great site for finding high-quality photos, as well as posting and sharing your own photos. Once you create a Flickr account, you can upload your own photos and "favorite" the photos of others. When someone posts photos in Flickr, they have the option to make them public or private and to license them. The licenses range from "All rights reserved" to a variety of "Creative Commons" licensing. Let's talk a little bit about some of the "Creative Commons" licensing options--in particular, some of the terms we encounter. "Attribution" is present on all; this term means that we must cite the source of the photo - in this case the Flickr user. "NonCommercial" means that we can't make any money from the use of the image - is anyone paying for your PowerPoints? "ShareAlike" licensing requires that any modifications we make to the photo be shared back with the community (i.e. Flickr). Finally, "NoDerivs" means that we are prohibited from creating derivatives works from the photo - for example recoloring or altering the photo to create an entirely new version. 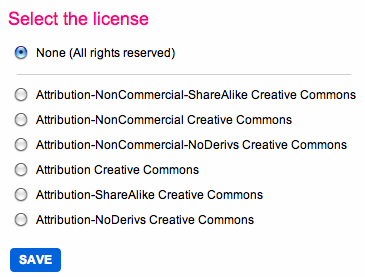 Within Flickr, we can navigate to "Advanced Search" and limit our search to "Creative Commons" licensed content. View more presentations from State of Nebraska. Now let's dive into our 10 Questions to Ponder! #1 How do we support the changing role of teacher? #2 What is the role of the teacher? These questions both deal with the role of the teacher, so we've combined them. We found this diverse set of photos by searching for terms such as "teach," "teacher," "teaching." and "professional development"
Now a little more on Flickr. We really like the two the photos from "superkimbo in BKK" that we included above. We can click on her username to see her "photostream" - the images she's posted to Flickr and made publicly available. Wow - she's posted some really great photos. We can continue to "favorite" individual photos - as we've been doing, but if we come across a Flickr user whose work we really like, we can also add them as a "contact." When you add someone as a contact, you will get an e-mail every time they upload a new photo. This is a great way to keep up with their work. You'll see some great photos from user paurian later in this blog post. Now let's get back to our questions. #3 How do we help students discover their passions? The first photo we found by exploring paurian's photostream; the second by searching for "students" and "passion." #4 What is the essential learning that schools impart to students? There may be better photos to describe essential learning, but searching for "light bulb" we found this image, which makes us think of spark, imagination, or idea. #5 What is the purpose of school? You can find lots of pictures searching for "school" "university" or "college." This is a great photo of the Front Quad of University College, Oxford. Apparently, it's very difficult to get permission to take photos here. #6 How do we adapt our curriculum to the technologies that kids are already using? We found this photo by searching for "adapt" and "technology." This isn't one of Mike's cats. These photos we found with search terms such as "kids," "technology," and "learning." BONUS QUESTION Do we risk kids becoming addicted to technology? #7 What does an educated person look like today? We love this photo - would you have guessed that we searched for "educated?" #8 How do we change policy to support more flexible time and place learning? Time: These images were discovered searching for "time" and "clock" - you can even try "tick tock." Place: These images were found with search terms "world" and "Earth." #9 What are the essential practices of teachers in a system where students are learning outside of school? We found lots of interesting stuff by searching for combinations of "informal," "learning," and "education." #10 How do we ensure those without privilege have equal access to quality education and opportunity? To find this figure we searched for the terms "rich" and "poor." That should get us started. Next week we combine these images with our questons to create slides - stay tuned!